Enjoy a Pre-Valentine date with CNBLUE at 2016 CNBLUE LIVE [COME TOGETHER] in Singapore! Mark your dates Boices! South Korean quartet rock band, CNBLUE will be back in Singapore on February 13 for 2016 CNBLUE LIVE in Singapore [COME TOGETHER]. The four-piece band last visited Singapore in 2013 when they rocked out with over 7000 fans for over two hours. Check out our review here! After a three year long wait, fans can now spend a pre-Valentine date with the band! The quartet is no doubt one of the most prominent band in Korea’s music industry. CNBLUE recently held a series of successful concerts in Shanghai, China and Seoul, Korea, where they charmed audiences with a string of hits for over two hours. They performed a total of 21 songs — out of which 19 were members’ compositions — including those from their latest album 2gether and Japanese single album, White. It will be a night of endless surprises, as the quartet is set to showcase their upgraded vocals and musical talents through live performances and new renditions of their songs. Domino and I’m a Loner will be given fresh leases of life on the synthesiser, and audiences can expect a wide array of musical styles ranging from the jazz pop intro in LOVE, to the reggae-influenced Rollercoaster, as well as ballads Hold My Hand and Irony. Tickets are priced from $118 and will go on sale from November 22, 12 noon via Sports Hub Tix. 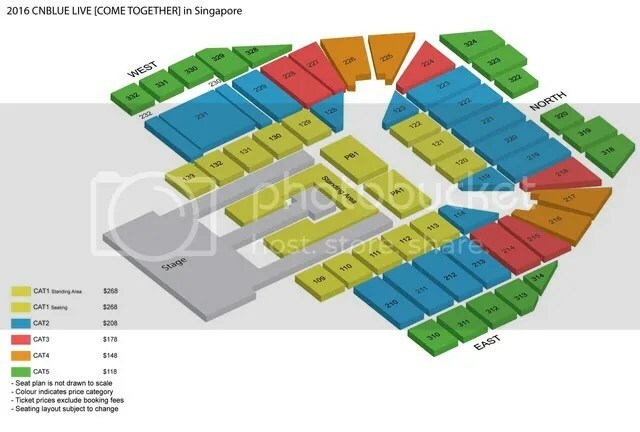 200 limited VIP packages (only available via online, hotline and Singapore Indoor Stadium Box Office) which will include entry to VIP soundcheck party and two official concert merchandise items, are also available for purchase at $98 for all ticket holders. Tickets are also available at all Singpost outlet (except VIP Package) and Singapore Indoor Stadium box office. 2016 CNBLUE LIVE [COME TOGETHER] in Singapore is promoted by One Production and organized by FNC Entertainment. For more information, follow One Production on their official Twitter and Facebook Page.